My husband and I love to spend time in the kitchen together. We often pour each other a glass of wine, play our favorite cooking playlists, and then the reality of having an 11 month old brings us back to our current existence. These days we don’t have a lot of time to create a delicious -time consuming- dish.We cook the basics of quick foods we love and add a little flair to the overall recipe. It’s not hard to sautee Bok Choy, definitely not hard to make rice of any kind, and pan searing scallops is not an overwhelming task by any means. Boiling 2 cups of water with a dash of salt (to taste) and one teaspoon of butter. Once the water came to a boil we mixed in 1 cup of brown jasmine rice and covered. We let the rice simmer on low heat and put the timer on for 45 minutes. Next came the Scallops. We marinated our Sea Scallops with Tequila and fresh lime juice and added Sea Salt before letting them pan sear on high heat for 3-4 minutes on each side. The Bok Choy. In a separate bowl we mixed 1 teaspoon of ground ginger, 1 tablespoon Soy Sauce (light sodium), 2 cloves of garlic, and 1/4 cup of water. Place Bok Choy in covered sauce pan on medium heat slowly pouring half the sauce in the pan. Shake the pan occasionally and cook for 2 minutes. Then add the remaining sauce and cook for another 2 minutes. My estimates based on MyFitness Pal App was a total of 250 calories for the entire dish. 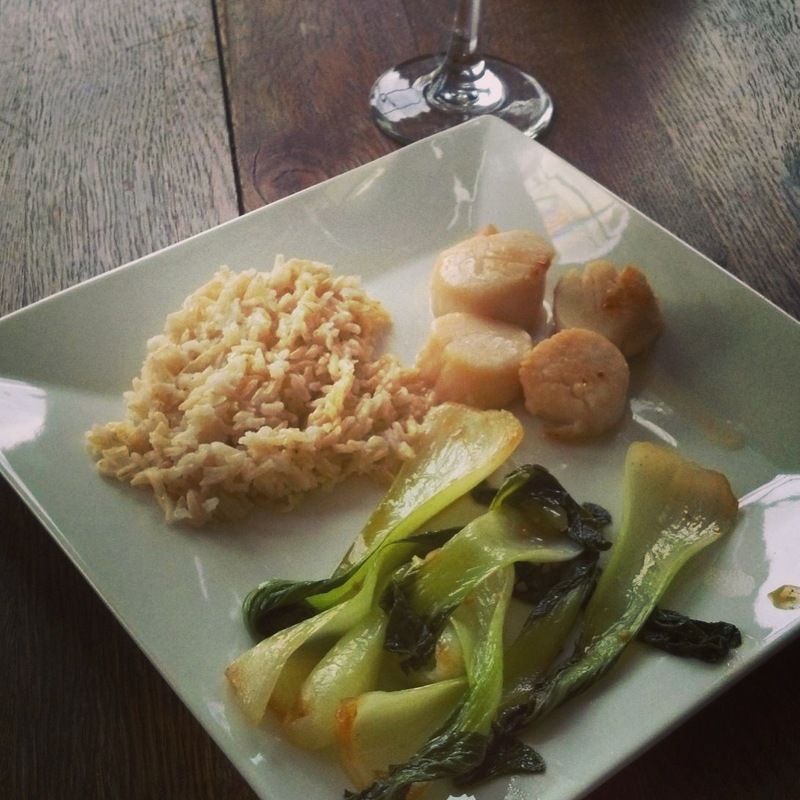 I served myself 4 oz of Scallops, 1/3 cup of brown rice, and a serving of the Bok Choy which is very low calorie. Aside from the rice which we put on about 30 minutes prior (that only took about 5 minutes to get started) to starting the rest of the recipe, total cook time was 10-15 minutes including prep. So give it a try and maybe add a little bit of your own creative juices; you will not be disappointed. Next Post Dry Bars! The new craze!